The cover story of the Vol. 3, No. 11 edition of The Pride relays ASI election results. 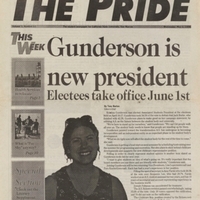 May 1, 1996,” University Archives at the CSUSM Library, accessed April 20, 2019, https://archives.csusm.edu/student-newspapers/record/112.